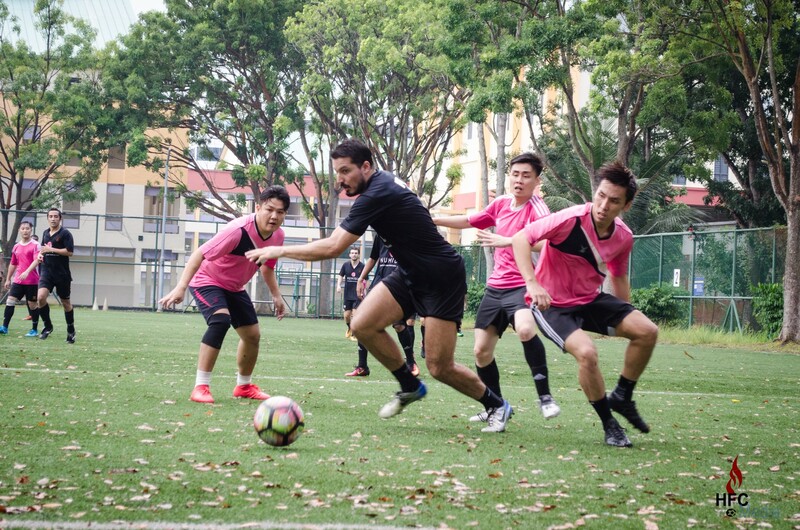 With the rescheduling, the Hilderincs were paired up against Yoshiko FC in a friendly game, though the Blacks were ready to use the opportunity to grease out some gears, heading into the second half of the ESPZEN Saturday League Division 2 campaign. While the probability of some wishes coming to pass may be far and few between, the Blacks’ yearning was heard when Cristian Peligros, HFC’s multiple award winner and the key component of their title winning run last season, returned to the side, albeit expectantly, giving them a massive boost for this terms objective. However, the plans to bed last season’s 35 goal hero back into the demands of the local weather was scrapped when the Blacks, with just eleven at kickoff, was forced to start the Spaniard alongside debutant goalkeeper, Moncef Loukili, with one of the usual custodians, Lim Yong Kiat, seeing his own wish of playing outfield granted, and did reasonably well in his cameo away from the sticks. Despite a positive start, the Hilderincs were pegged back when Yoshiko FC, who despite their name, had little to with anything Japanese, took unexpected lead against the run of play, though the Blacks’ backline of Sergey Darovskikh, Kavin Singh, Nicholas Ledenmark, Adi Ravikumar and Sunny Tharidu in his defensive midfield role were impressive, before and after the goal. But with the Blacks knocking on the door even before the deficit were soon on level ground after a fine interplay between Diogo Baptista, Sebastian Eraso, Mathieu Morand-Duval, Nico Olvera and Ian Morris to setup, who else but Cristian Peligros to put the ball into the back of the net, exactly 189 days after he last scored in the game that handed the Hilderincs their first ever league title. Within minutes the Blacks had a claim for a stonewall penalty, only for the referee to remained unmoved when Peligros was bundled over in the box. However, with another bite at the cherry, the official pointed to the spot after Nico Olvera was upended moments later, but in giving in to the persuasion of the former, Cristian sent the ball over the goal for only his second ever miss from the spot, the last which incidentally came in the same title winning game, bringing him a full circle. After another penalty call gone amiss, the Blacks thought they had taken the lead when Nico Olvera’s shot was parried over the line, but astonishingly, the referee yet again denied it, giving a corner instead after the keeper had blocked Ian Morris’ follow up. If the Hilderincs had felt hard done by the apparent oversight, it lasted a mere second when Cristian Peligros thumped in an Ian Morris’ corner, a reminiscence of last season’s partnership between the two, and in fact the skipper had suffered most with withdrawal syndrome, seeing his goals dry up after netting 12 times in 22 games, only second to the big Spaniard, as supposed to only 2 in 17 games so far. Normal service was soon resumed when the “Goal Beast” got his customary hat-trick with a carbon-copy of his second, heading in another Ian Morris set-piece to turn the game around going into the break. Even though the Hilderincs returned to the second half with several alterations, they resumed the action in full tilt, giving the opponents little rest in between their constant harassment and waves of attack. Having played a vital role and denied a clear goal in the first half, Nico Olvera set the pace for things in the second when he put the Blacks four goals to the good with a well-taken goal, demonstrating his own prominence in the side with his impressive goal a game ratio. With the two youngsters in Aamir Firki and Mohd Erzan running the flanks, Hernan Algarra continued to display his deft touches, playing both of them into decent attacking positions whenever he had the ball at his feet as he did with the others around him. And even before Cristian Peligros was re-introduced to the action, the Hilderincs had added two more goals through Aamir Firki and Mathieu Morand-Duval, who finally got himself on the scoresheet, a prefect boost for the Frenchman who had been working hard for it since his bow a month ago. Having been hit for six with more than half of the game left to play, the opponents reduced their approachability considerably, allowing the Blacks free reign, though they showed an opportunistic side to nick two goals against the run of play. However, with Cristian Peligros netting another hat-trick in the second half and Nico Olvera putting the lid with the final goal, the Hilderincs ran out 10-3 winners on a day when they looked very much like their fluid self, and though the challengers were correspondingly raw, there is taking nothing from the Blacks for their proficient individual and collective display. And with a majority of the season still left to play, and having placed themselves in a strong position with the work done so far, they will look constructively at the objectives set as they await Naughty Devils next Saturday.